George, Joey, and Henry and I started planning their Tanzanian Safari in March 2017 for their November 2017. Three photographers on Safari in Tanzania - I was ready to see some great pictures of wildlife and landscape and I was right. George, Asante sana for sharing your Safari Story with us and your amazing photos.
" We had a spectacular time! In pretty much all respects, it was everything I imagined it would be. Festo and Nathan were great but Nathan gets a special mention as he had us for the 9 days and 800+ kilometers; he was not only a wonderfully knowledge guide but an excellent (and patient :-)) travel companion. Life in the Land Cruiser was great, even with the free African Massage (as Nathan described traveling down some of the roads). Camps and lodges were very comfortable and we were very well fed and taken care of in the camps. Ngorongoro Farm House was a nice oasis after a long day drive down from Kati Kati ... walking up the hill and seeing the sunset over the lawns, someone handing me a cool cloth and lemon water, I thought "Ok, I think I could hang here for a while". The game drives and wildlife viewing were superb and the weather ideal; we'd certainly recommend that time of year to go, rains, not a factor at all and in fact welcome to keep the dust down. Temperature nice and summer-like, crowds not a factor at all (well almost never, there was that leopard site ... :-)). It would be nice to go back and see the same areas right after the long rains though ... the stark contrast I imagine. We missed out on the rhino at Ngorongoro and only saw the wildebeest hover but not cross at the edge of the Mara but otherwise, we saw all the big and small mammals and lots of birds (about 100 names on our list). Our cameras got a good workout and we're still curating the 5k+ images each of us have. Tough to capture the full impact of zebra and wildebeest out to the horizon in the Central Serengeti ... that is quite a memory. When we were in the crater, we watched this big old bull elephant saunter across the crater floor towards the marsh where Nathan had us positioned. The old boy stopped maybe 12 ft away and just stood there, dust bathing and looking at us for about 15 minutes and then just continued on his way. Being a city boy, I don't see the Milky Way very often due to light pollution so I hoped to get a night sky shot at some point on the trip. At Kichuguu, what was just as memorable was the honor guard of camp staff we had around us, simultaneously ensuring we didn't get eaten and just as keen to look at the results. Thank you for putting this all together for us and hope to do it again someday. " Makes me happy when my Safari goers get to fulfill their Tanzanian Safari dream. What is your Safari dream? We can help make it a reality. We were having high tea - as one does on Safari - when Jairo, our Chada Katavi guide rushes to say we should get going because the camp manager Hamza has spotted a few lioness in a tense mood. We hopped in our Safari vehicle thinking we were going to see a hunt - topis were close by and on edge - instead, what we saw was Nat Geo worthy. A fight between a single lioness, who we believe was trying to hide her cubs and walked away from the den and two lionesses from the Chada pride who were trying to protect their territory. What we witnessed was dramatic! I was nervous because I was not prepared to see a fatality. The single lioness showed all the signs of submission - she was yawning, licking, lying really low - nothing helped. It all transpired in less than a minute and a half. Enjoy the sequence. And done. The Chada pride's territory was marked with lots of rubbing the bushes and a pee here and there. They two Chada lionesses walked away after a few minutes into the bushes - we had sundowners with them. One of the Chada lionesses may have bitten the mama lioness hard - see some red around her teeth - but I think everyone left intact. You never know what you will see on Safari. These are my Safari Stories from my Epic Tanzanian Safari to Katavi National Park, Mahale Mountains, and Ruaha National Park. When I first talked to Ravi, he said he wanted to take his Phase One Camera to Tanzania. Now I know a thing or two about how awesome Phase One cameras are because of uber photographer and my dear friend Andy Biggs. Keeping his photography passion in mind, the Safari had to be private all the way so that he would have one guide and one vehicle the whole time. Ravi was also keen on seeing the wildebeest migration; I suggested we make a pit stop in Central Serengeti at Kiota Camp before he carry-on to North Serengeti and Serengeti Safari Camp. Northern Serengeti was a must for their August Safari because that is when the migration is in that area. Ravi captures Tanzania beautifully. I think he will be back.
" Absolutely the finest vacation we have taken in our lives! Mefi was outstanding with her service to make our trip most enjoyable and memorable. She was responsive to us during the planning stages leading up to our trip and was always available to answer any questions we had. Given this was our very first safari trip, we didn't know what to expect when we set out to think about all this and Mefi made it very simple and practical." "The lodges she picked for us were excellent! The service in these camps were simply outstanding. The folks in each of the places were caring and helpful. The guide we had for our 11-day trip Rowland was an experienced guide with a ton of patience. He was equally passionate about the trip each day and helped us experience the ultimate safari. Highly recommend Journey to Africa and Mefi! Thanks Mefi!" - Ravi and Jayanthi R.
It was such a pleasure working with Ravi and Jayanthi on their Safari. Jayanthi was going along with her husband but I do believe she enjoyed it just as much. Woot! And Ravi, amazing photos. Asante for sharing them. You ready for your ultimate Safari? Ask for details. When you landing in Tanzania or Kenya, the first thing you will hear is Jambo! Jambo means hello in Swahili. Don’t worry, the customs official, your Safari guide and most people you will pass on your Safari will speak English, but saying Jambo to them will let them know you are happy to be in Tanzania or Kenya. Want to know a few more words so you can really flex your Swahili. – Habari gani? – How are you? – Asante – Thank you. - Asante sana - Thank you very much. – Lala Salama – Sleep well. – Habari za asubuhi? – Good morning. To really impresss a local. – Shagala Bagala – ‘this is messed up’ in a fun sense. – Poa – I am chilling. - Twende - Let's go. Want to know any specific word? Email or call me and we can chat in Swahili. Now let's get you on Safari so you can practice your Swahili. We know Mother's Day seems to have more buzz, but you are loved just as much. Here's why we think you should be given a gift of an amazing Safari. Making memories on your Safari. Our father's always come back and say, the experience of being in stunning nature, seeing a range of wildlife in some of the world's most amazing settings, spending time with the people you love equals Safari stories to last a lifetime. We make sure we create this experience for each of our fathers using our personal knowledge. One of the best things you can give the father in your family is the gift of quality time. The hours relaxing during your drives in search of the wildlife, the calm evenings by the campfire under the African skies to the lovely ambiance created by your lodges and tented camps - you will be given the gift of slowing down and more time to have a deeper connection with yourself, your family and friends. We are happy to create this magic for you on your Journey To Africa Safari. For the father who likes to tinker with his camera or is a pro photographer, being on Safari is pure bliss. From the range of wildlife and birds to the stunning landscapes and warm people, there is never a dull day on Safari. From my client Carlos Mata who took his son Jeff on a Safari.
" Probably my best memory with Jeff was breakfast in the Serengeti. We rarely ate in camp, but had them pack a breakfast which we ate in the bush. Our guide would set up our breakfast table overlooking a wide expanse of grazing wildebeests and zebra, and we would sit there sipping that rich Tanzania coffee at sunrise. We would wonder if a big lion would come out of nowhere and spook the heard. " Go ahead. Let's put together a great Safari itinerary and surprise the beloved father in your life. Start your Father's Day Safari. On Safari, most people are so excited to see the Big 5 or the larger walking wildlife. But I am going to add, keep a look out for birds. There are so many lovely birds you will get to spot on Safari. From the common but oh so beautiful lilac breasted roller to the lifers. You know what I am talking about if you are a birder? Into birding, do let us know before you head out on Safari. We will let our guide know so he can bring all the birding books for you and him to pour into on your game drive. If not, just enjoy them with your binoculars. You will find hundreds of resident birds and many that fly all the way from Europe and Americas. 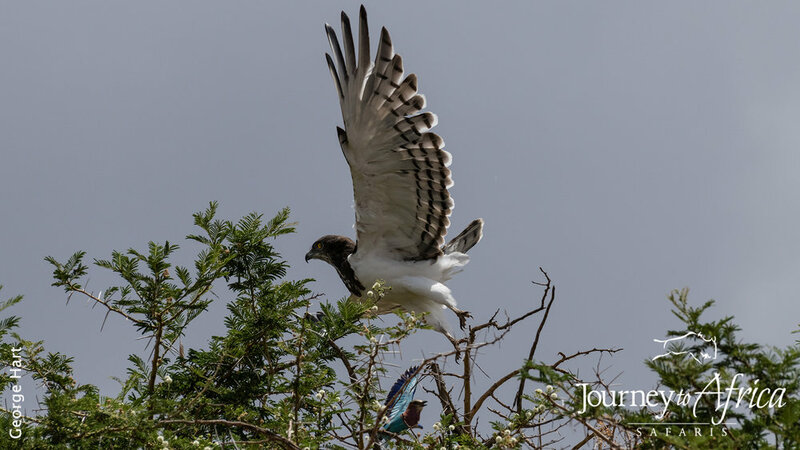 Those birds that have flown from other places come here to Tanzania and other East and Southern African countries at the risk of being netted. A lot of countries on their route will poach and illegally trap them. Organizations around the world who love birds are spreading the word to people like you and me who were not aware of such activities. Paul Oliver was the one who opened my eyes when we were birding in Lake Natron. He told me about the plight of the wadders, who are being netted by the thousands when flying over the Mediterranean countries. I leave you with some lovely birds captured on my Safaris. Every time I go on Safari, I learn to love them more and more. Your turn? Come shoot them, with your camera.